The recent winner of the much coveted award from Somerset Life Food and Drink for the best newcomer 2017, Tiffin at the Clevedon Pier is revelling in its success by carrying on as usual serving delicious and inventive fish dishes, from its quirky glass building at the head of the pier. It really is quite an experience to visit for dinner; as the Pier is closed at night you are buzzed in through a large wrought iron gate and guided by candlelit lanterns to be escorted into the restaurant, down a spiral staircase. The building is completely constructed of glass, including the ceiling, so the starry night sky, the pier and the twinkling lights of the far distant coast are visible and the interior is lit by dozens of candles much adding to the cosy charm. We settled at a corner table and looked through the menu; the restaurant was full with a hum of happy diners but the acoustics are good and unlike some modern restaurants we were able to speak comfortably without being drowned out by clatter. We were definitely in the mood for a fish feast and lost no time in ordering; to start, I chose smoked trout with gherkin, dill, lemon mayonnaise and pink salt, and my husband the crayfish tortellini, tomato, English pea and basil. For the main course, I decided on whole Cornish sole, filleted, with mushroom champagne sauce, muscat grapes and pancetta, a delightful sounding combination. 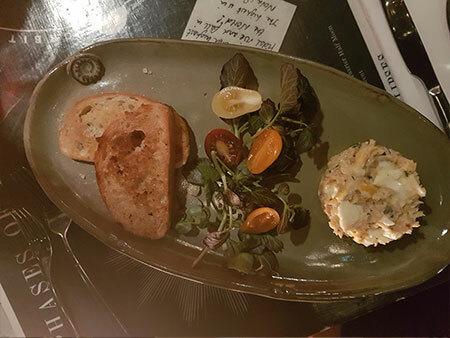 Anywhere that features bouillabaisse or any kind of fish stew scores highly with my husband, and he duly ordered the Tiffin fish stew with saffron rouille and crostini. Whilst we waited, the most delicate amuse bouche was served; a tiny poached quail’s egg on salty fingers (a.k.a. samphire) with citrus mayonnaise; very stylish and we loved it. Our starters arrived beautifully presented too, the crayfish tortellini was excellent and I enjoyed the smoked trout with its subtle lemon and dill flavours. Luckily we had said most of what we wanted to say before the main courses as they took away our power of speech! 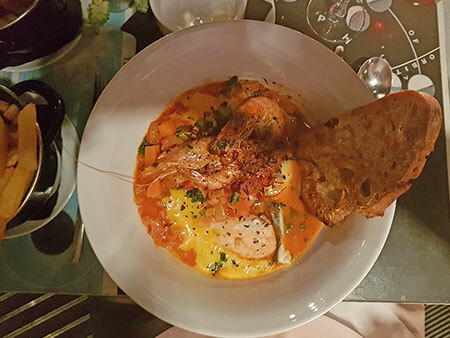 The fish stew was served in an enormous bowl topped off with a giant crostini and large shell on prawns, and my sole, deftly filleted and finished with the mushroom and champagne sauce was a sight to behold. We savoured them both to the last mouthful before settling back with a contented sigh. However, we did visit the ‘Naughty Corner’ as their dessert menu is called before we left and shared a taster plate of five of them which was naughty but very nice. For the record the rose frangipane was my favourite and the sticky ginger loaf his. Our evening felt special, service was faultless and we would definitely visit again.